There are a number of views about the role of general practice and social prescribing. 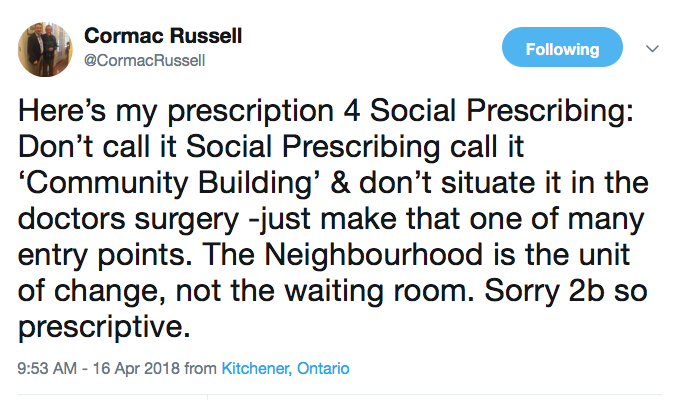 Some see social prescribing as the key mechanism for connecting primary care to communities while others are more critical seeing it as a diversion from asset based community approaches. One of the reasons for this debate is to do with the role of general practice. Are GPs just referring patients into ‘community solutions’ at the press of a button or are they playing an active role in responding to the social circumstances that make people unwell? I recently spoke at the launch of the Torbay FAIR project – and heard Steve Barriball CEO of Citizens Advice Exeter talk (based on their report Appealing for Common Sense ) about the experience of people who had been turned down for Personal Independence Payments and Employment Support Allowance by the DWP contractors the Centre for Health and Disability Assessments (CHDA) who are a subsidiary of Maximus. Getting access to Personal Independence Payments and Employment and Support Allowance is a three stage process. 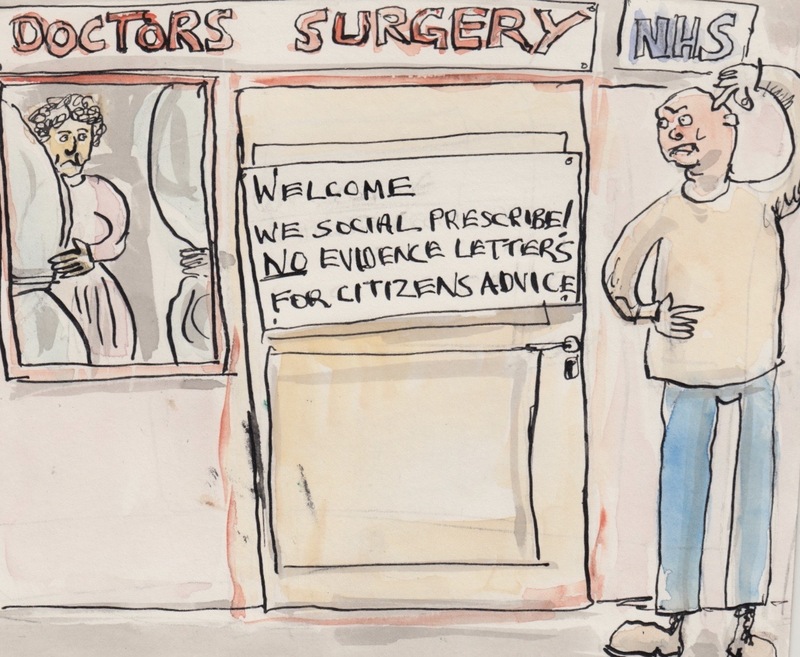 GPs are important, at the appeal stage if Citizens Advice are involved they will often ask GPs to provide further medical evidence as part of building a case to demonstrate an individuals poor health. Recently the Local Medical Committee where I live after taking advice from the CHDA “GP Ambassador” produced guidance stating that GPs do not need to respond to requests for ESA Claims & Appeals (Feb18) from local Citizens Advices Services. GPs are under a great deal of pressure (as are local Citizens Advice services!) and most importantly so are the members of the public who are applying for Personal Independence Payments and Employment Support Allowance. GP Evidence letters are most important at the Appeal stage and this is usually when Citizens Advice staff get involved – Citizens Advice guidance is here. As the evidence shows this appeal process is (regrettably) a necessary corrective to poor decisions made at earlier stages in the application. In my view good practice means GPs responding positively to Citizens Advice requests – particularly at the appeal stage. From personal experience I know that there are many excellent GPs who work with disadvantaged communities who would not give a seconds thought to responding positively to such requests if they consider that access to benefits would improve a patients health, even though they are not specifically funded to do this work. In many cases receiving PIP will reduce pressure on the NHS. This brings me back full circle to social prescribing. GPs (like Citizens Advice) are interface services. They stand on the border between statutory and professional services and individuals and communities – the place that Eileen Conn calls the Space of Possibilities. There is a real risk that the hard work of dedicated GPs will be pushed out of sight (as is the case for many who experience poverty and health inequalities) unless professional bodies such as the BMA, RCGP and LMCs recognise that if we are to respond to health inequalities good practice is engaging proactively with peoples circumstances rather than just pressing a button. I am interested to hear whether GP bodies in other parts of England take a similar approach. For social prescribing we have a very short form to complete and then Beverley – a kind, empathic human calls the patient and spends time with them working out their situation and helping them think about what might help – it’s about a dialogue, not ticking boxes. She’s only contracted to work here one day a week, but could easily be fully occupied every day. Thanks Dan it was probably clearer in the original report – I have sorted this in the body of the text now. Completely agree with the sentiments of this article, and find the attitude of the Sheffield LMC appalling. It is either disingenuous in the extreme, or worse, the LMC is, in effect, colluding with Maximus, allowing themselves to be co-opted in the application of measures that reduce people’s chances of being awarded their lawful entitlement to benefits. It seems odd in the extreme that the LMC would even think to seek guidance from Maximus’ subsidiary, the Centre for Health and Disability Assessments with this respect. Of course they would advise the LMC that GPs are under no obligation to support their patients in their appeal process. The reason being that Maxmus are seeking co-opt GPs in their efforts to reduce the chances of patients winning their appeal, thus increasing their chances of hitting their targets of denying welfare benefits to those with long term health conditions and disabilities. However there are examples of projects that are seeking to resolve the issues from both sides, of GP workload in supporting appeals, and patients getting the help they need to win the benefits they are legally entitled to. One such is a recent pilot in a number of Deep End GP practices in Glasgow, in which welfare benefits advisers worked in GP practices and had access, with patients’ consent, to patients’ notes and could draft such letters for the GPs, thus reducing the burden on the GPs, and maximising the patients’ chances of winning their appeals. The results were immensely positive for both patients AND GPs. Lastly, yes, its time for the BMA and RCGP and others to show leadership here, on two levels. Firstly to call out the carnage that the current DWP system, and its subcontractors are causing to their patients and their patients’ families lives and are having in whole communities. Secondly to get the profession behind the idea that it should be supporting patients in maximising their chances of challenging the denial of their legal entitlement. I sit on PIP appeal panels and GP letters are so crucial – quite often one of the reasons why people need to appeal is they assume that because DWP ask for GP/Consultant details they will be obtaining medical information – WRONG! !